With warmer weather upon us, nothing is quite as refreshing as this fruity Classic Rum Punch Cocktail with the flavors of the tropics. Not that I would know much about the heat of warmer weather. It’s snowing again in Denver. And yes I know it’s good for the plants and the water supply and I try to remain appreciate of any water gift in this semi arid environment, but you guys make it hard. Photo after photo of everyone’s tulips and crocus and flowering bushes and sometimes I just want to cry. I’ve lived here for thirty years and yet I have never quite adjusted to this month long delay we have of real spring. Oh sure we’ll have some nice days too…but we can also have a blizzard or two. Totally schizophrenic weather. I made this cocktail last weekend on one such beautiful spring day. It was time to clean up my yard a bit and I was excited when I found crocus starting to bloom. Especially since I had forgotten that I had planted them; a spring surprise! So I decided to go full steam ahead with a warm weather cocktail. Of course that would mean that it snowed two days this week; I almost thought to wait longer before sharing. But I decided no, I need to share this now for my friends in the north and others up high in the air like me; we need to be reminded…warm weather is coming; REALLY! 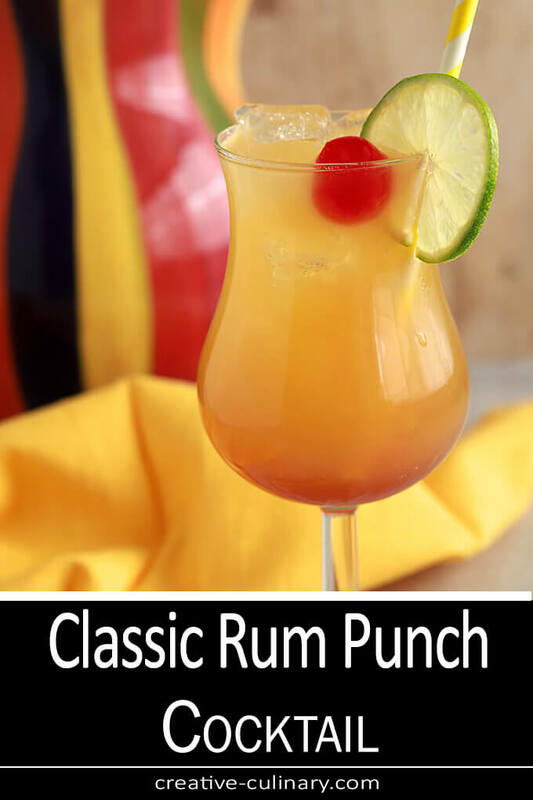 The Classic Rum Punch Cocktail is not exactly a punch in the regard that it is mixed for a crowd. You can of course but it’s just the name of this drink that does mix up a lot of ingredients. I’ve had the cocktail with 4 different rums but I think that’s overkill; 2 or 3 is plenty. 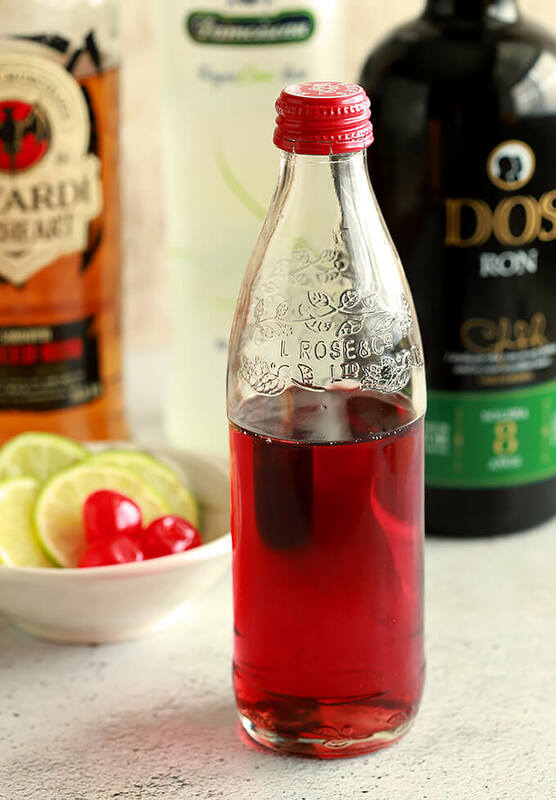 Grenadine is important to get the effect of this drink; you can buy it but I make my own and it’s so easy. In France, the word for pomegranate is grenade. From that pomegranate syrup has become grenadine. I simply boil down some pomegranate juice with some sugar and let it get a bit thickened; it’s so much better than the bottled stuff (even if I did save the bottle from the last time I bought it; the bottle is still perfect!). I’ve included the proportions in the Recipe Notes. Dark rum is a given and for me so is a spiced rum which is a bit sweeter and with a hint of vanilla. For this cocktail I also added what I can only call ‘sort of coconut rum.’ What is sort of coconut rum? Well, first the story goes that I thought I had a bottle of coconut rum when I started pulling together this creation. I could almost see it in my stash. But it was nowhere to be found. So I punted. I poured a couple of ounces of white rum into a blender, added a couple of tablespoons of coconut and zapped the two together. That wasn’t quite enough to impart flavor to the rum though so I let the two get to know each other for about an hour…big difference. Could you do without the coconut rum? I suppose so but it just seems that a tropical type cocktail NEEDS coconut doesn’t it? I’ll get another bottle of coconut rum despite not typically enjoying flavored liquor; it is really perfect for summer drinks. Still, it’s not an absolute so do what you want; use it, don’t use it, flavor your own…all work in my book. 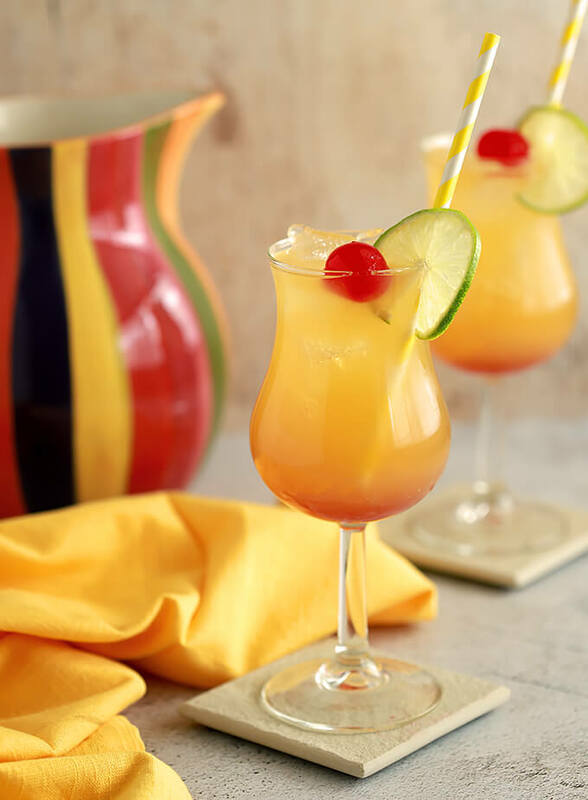 So, whether you are enjoying a gorgeous balmy day or waiting for them to appear; enjoy this Classic Rum Punch Cocktail and dream of summer vacation, beaches, or lazing by the pool. It’s a perfect fit. Summer drinks are the best; always filled with the freshest of ingredients; here are some of my favorites! This margarita is simply the best I've ever made. All fresh, good quality ingredients create an outstanding drink. 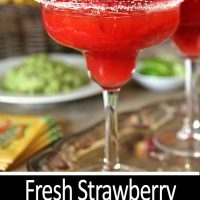 A beautiful and delicious version of a margarita with fresh strawberries; perfect for summer events. Rum Punch is a classic cocktail that evokes a vacation in the tropics. Rum and fruit juices join with a dash of colorful grenadine to create a flavorful and beautiful cocktail. 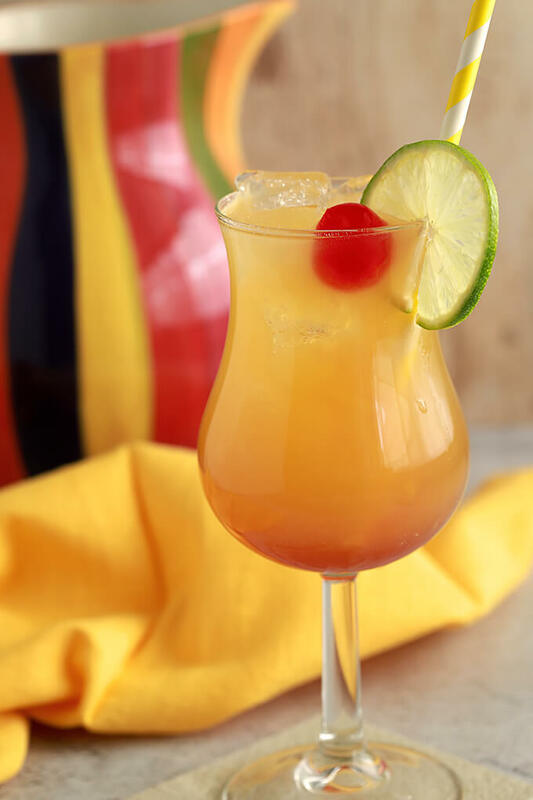 In an ice filled glass, combine the pineapple juice, orange juice and rums. Gently stir. Slowly pour in a splash of grenadine. I like to pour over a spoon that is upside down with the tip near the glass. The grenadine will sink to the bottom. Splash 1/2 ounce of the dark rum on the top (optional). Garnish with a slice of lime and a maraschino cherry. Pretend you're in the tropics. Combine the two ingredients over medium heat and stir until the sugar has dissolved. Turn the heat to low and let it simmer until the mixture thickens to your liking. If you overdo it, you can always add back in a bit of water. Remove from heat and cool slightly and then add the lime juice if using. Refrigerate until cold before adding to cocktails. This is good stuff! Really like rum drinks, and this is a winner. I’ve never actually bought spiced rum — shocking, isn’t it? I’ve ha it, of course, but find it easier just to add int he flavors if I want that effect. Anyway, this looks excellent. Cold here today and we just had some rain and it’s kinda gloomy — I need something like this to bring spring back into my life! 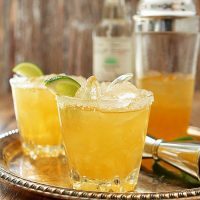 This cocktail is well known as a combination of different rums so it worked but in a pinch? I would use both dark and white rum and call it good. The juices are predominant. And it’s a good sipper…whether it is warm or we are dreaming of it!